BEinGRID focused around two complementary activities. Firstly, the project undertook a series of targeted business experiment pilots designed to implement and deploy Grid solutions in a broad spectrum of European business sectors. Eighteen business experiments were planned in the initial stage of the project with six more introduced in the latter stage. Secondly, a toolset repository of Grid service components and best practice was delivered to support European businesses that wish to take-up this important new technology. Coupled with these two main activities were cross workpackage technical support and development, dissemination, demonstration and training activities. To minimise redevelopment of components, BEinGRID deployed innovative Grid solutions using existing Grid components from across the European Union and beyond. The outcome of the project was a series of success stories from the take-up of Grid solutions by the businesses represented in the project, a repository of Grid middleware components and best practice, and a strong exploitation message from these success stories to stimulate the long-term take-up of Grid solutions by European business. 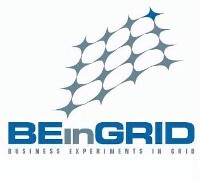 The consortium of more than 100 partners was drawn from across the European Union and represented the leading Grid research organisations committed to its business use and a broad spectrum of companies keen to assess the benefits to their productivity, competitiveness and profitability from their use of Grid solutions.